Leslie Lerner Properties announces their new Spring Branch real estate listing at 6514 Schiller Street. This amazing new construction has a master suite on the first floor. 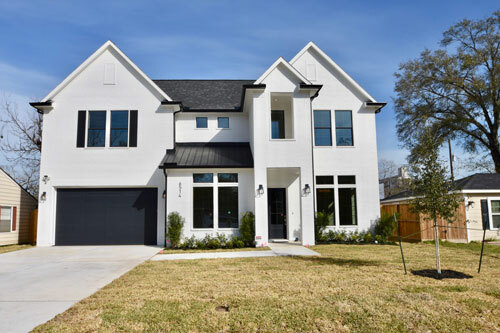 The house is stunning with a white painted brick exterior, 9 ‘- 11’ ceilings, wood floors, beautiful windows, quartz counters, wood beams, custom trim and cabinets, neutral colors, a game room, large backyard and outdoor kitchen. This house has it all! Enter the home a notice the gleaming wood floors, the large dining room on the right and a private study on the left. Continue through the entry to the open living area, breakfast room and dreamy kitchen with stainless, professional grade appliances, quartz counters and gorgeous tile accents. The first floor master suite and living/kitchen areas overlook the wonderful backyard and outdoor kitchen. This house is the entertainer’s dream! Follow the stairs, with a wrought iron railing, to the second floor and find a terrific game room, three additional bedrooms and a great amount of storage.